Eastern senior Kelsey Casto goes in for a layup, during the Lady Eagles’ six-point win over Miller on Nov. 29 in Tuppers Plains, Ohio. BELPRE, Ohio — Not this time around. 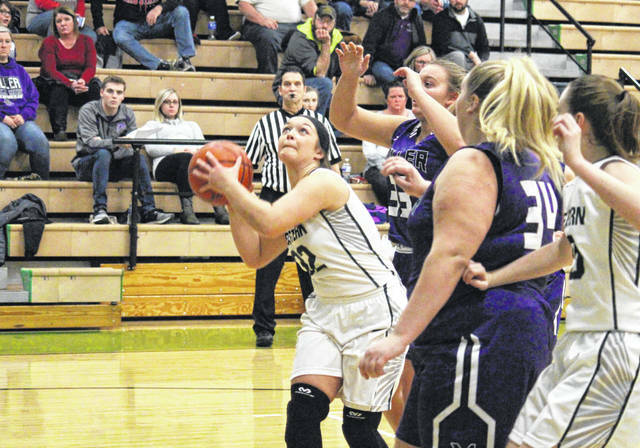 After being upset at Belpre a year ago, the Eastern girls basketball team had a positive reversal of fortunes on Monday night following a 47-32 victory in a Tri-Valley Conference Hocking Division contest in Washington County. The visiting Lady Eagles (2-1, 2-0 TVC Hocking) stormed out to a quick 11-8 first quarter advantage, then Alyson Bailey netted nine second quarter points as part of a 20-7 surge that gave the Green and White a sizable 31-15 cushion at the break. The Lady Golden Eagles (3-2, 1-1) tried to make a comeback bid and used a small 10-9 third quarter run to close to within 40-25, but the Orange and Black ultimately came no closer. Both teams scored seven points apiece in the finale, allowing EHS to wrap up the 15-point outcome. EHS hit 18 total field goals — including four trifectas — and also went 7-of-9 at the free throw line for 78 percent. The Lady Eagles also had eight different players reach the scoring column. Bailey led the guests with a game-high 17 points, followed by Kennadi Rockhold with 11 points and Jess Parker with five markers. Olivia Barber was next with four points, with Kelsey Casto and Ashton Guthrie contributing three points each. Kassandra Casto and Whitney Durst completed the winning tally with two markers apiece. Halee Williams paced BHS with 10 points, followed by Abbey LaFatch with nine points and Kyanna Ray with six markers. Eastern returns to action Thursday when it hosts Wahama in a TVC Hocking matchup at 6 p.m.